You are here: Home / Everyday Posts / Celebrate Reading and Win Prizes! Celebrate Reading and Win Prizes! MomActive contributor, Daddy Bookins of PeasandBananas.com, has finally released his first childrens book Outside with Lil’ Boo! Hosted by Me, Kelly Loubet, and MomActive’s own, Fiona Bryan! Twitter Party #LilBoo ~ 8-9pm ~ Reading to Children – we’ll discuss early childhood development and the importance of reading aloud to our children. MomTV MomActive Channel ~ 9-10pm ~ Meet the Author! Daddy Bookins will answer questions and discuss the book Outside with Lil Boo. We’ll be celebrating with LOTS of giveaways ~ TO ENTER head over to MomActive.com and add your twitter ID to the linky! Be sure to follow @banteringblonde @childhood @peasandbananas and @savorthethyme who is fielding child nutrition questions! Join us for a chance to win!! Keurig Platinum Brewer and K-cups – Keurig is great for those who love a cup of gourmet coffee, but dislike the measuring, mess and hassle that comes with an ordinary drip coffee maker. The system uses an innovative single-cup technology that ensures a fresh-brewed, perfect cup of coffee or tea every time. Simple choose your favorite K-Cup, brew and enjoy. With over 200 K-cup varieties of gourmet coffee, tea and hot cocoa from your favorite brands (Green Mountain, Tully’s etc) to choose from, even the most discerning coffee drinkers can find something they love! 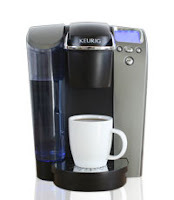 – Auto On/Off, Digital Clock, Adjustable Temperature Control and the “Set Your Favorite Cup Size” option. – Available at www.Keurig.com and retailers such as Bed Bath and Beyond for $169.95. Autographed copies of Outside with Lil’ Boo -an illustrated children’s book based on the creative events experienced through the eyes of Lil Boo in an array of outdoor adventures. From Ants to Birds or Oranges to Potatoes, you will be amazed at the wonders of playing outside. Follow Lil Boo and his imaginary friend Onote from the letters A to Z in a fascinating rhyming adventure. Huge gift basket from Earth’s Best – assortment of Earth’s Best products—baby food, diapers, wipes, cookies, cereal and more! Webkinz Jr. from Ganz – Webkinz Jr. pets are lovable plush animals that each come with a unique Pet Code and access to the virtual Webkinz Jr. world! $50 Amazon gift card – we love love love Amazon.com! $25 Starbucks gift card – make a pit stop, grab a paper and your favorite beverage … on us! $50 gift card for Label Daddy from The PR Place – Everything you ever wanted to know about the latest products. Thanks PR Place! Shoes shoes shoes! Planet.com carries all the top brand name shoes and will even ship and return purchases of $49 for FREE! e.l.f French Manicure Kit – trendy and stylish, do-it-yourself! Enter to win HERE at MomActive.com .………..and stay tuned for several super surprise items!